Jersey is a small island, 15km (9 miles) east to west and 8km (5 miles) north to south, situated in the Bay of St. Malo, c. 25km (15miles) west of Normandy and c. 50km (30miles) north of Brittany and is a window into Precambrian, Lower Palaeozoic and Quaternary geological environments. The other islands, reefs and stacks are similarly small and isolated, and are also geologically different, so they provide even smaller windows into older individual geological terrains. The following map illustrates part of the geology of Brittany, Normandy, the islands and the sea floor and shows outcrops of Tertiary (yellow), Mesozoic (blue), Palaeozoic (green and brown) and Precambrian (red and pink) formations. The scale is 1cm : 13km (c. 8miles). Geological setting of NE Brittany, Jersey, its reefs and western Cotentin Normandy); Brioverian shales (pink), igneous and metamorphic rocks (reds); Palaeozoics (green & brown); Eocene limestone (yellow). The principles used to determine the relative ages of rocks (the geological history) in any area are those of Superposition and Floral and Faunal succession in sedimentary (bedded) rocks. Briefly, these two state that the rocks which lie below were deposited first and are therefore older than those above. In layered igneous rocks, the principles are Superposition and which unit (structure) intrudes another, that which intrudes being the younger. The third principle, that of Uniformity (also called Uniformitarianism) when used with Superposition indicates the change of environments with time. The beds below are older than those above. The dykes are younger than the granite. 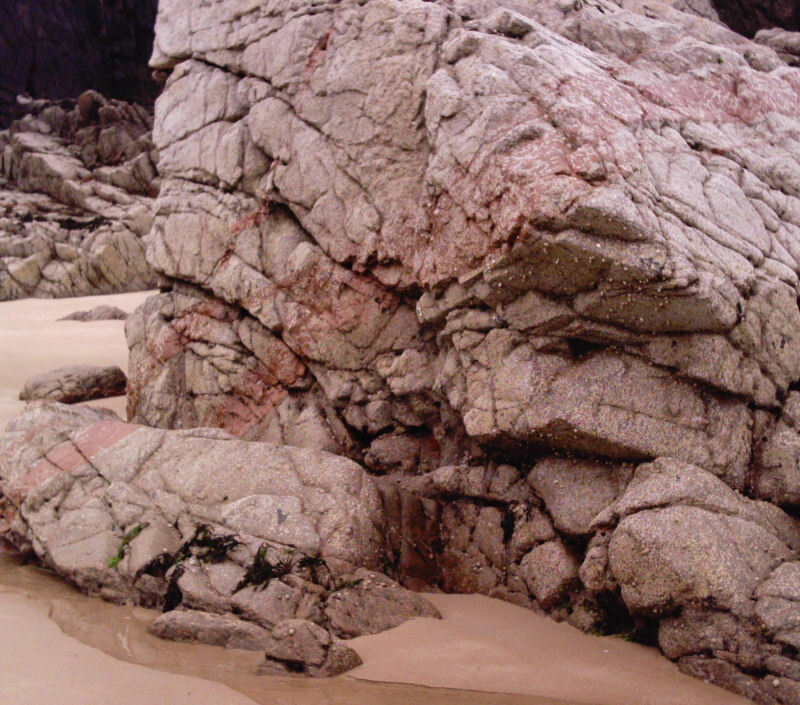 Jersey consists of sedimentary, igneous and metamorphic rocks. 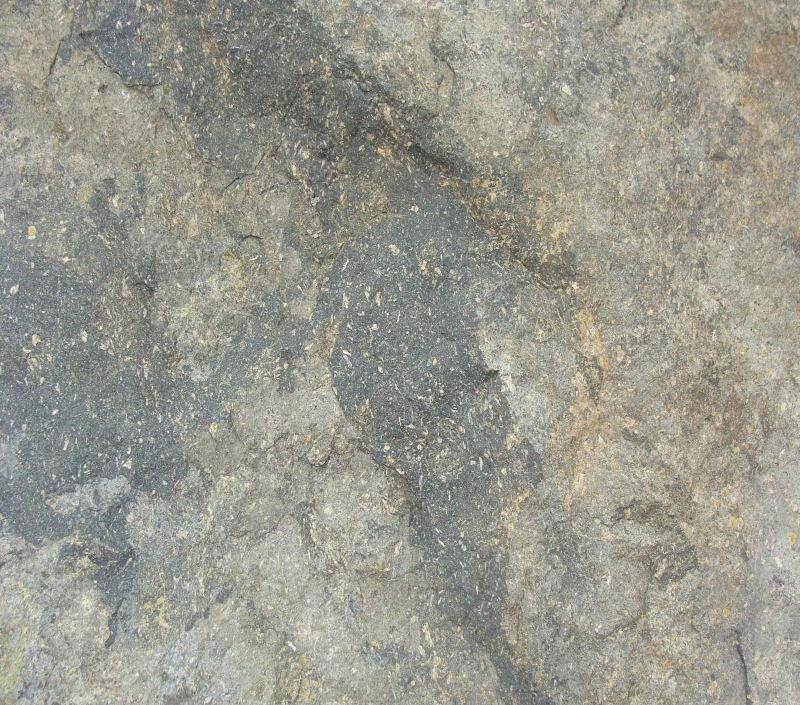 The succession starts with grey shales, unfossiliferous to date, interbedded with thin, lighter grey, ripple-laminated sandstones and greywackes (below left) of the Jersey Shale Formation, late Precambrian in age. These are overlain disconformably by grey, often porphrytic andesites (with minor basalts) of the St. Saviour's Andesite Formation, followed by maroon, flow banded, columnar-jointed (above right), spherulitic rhyolites and ignimbrites of the St. John's Rhyolite and the Bouley Rhyolite Formations, which in turn are overlain unconformably by a terrestrial conglomerate (molasse with clasts of variously coloured rock types) called the Rozel Conglomerate Formation, all generally considered Lower Palaeozoic in age. These formations have been folded several times and crop out from west to east across the central, east and north eastern parts of the island respectively. 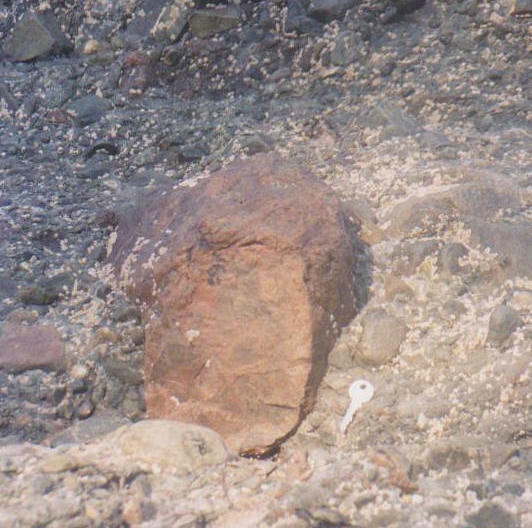 The intrusive igneous rocks are gabbros, diorites, granodiorites and attractive pink granites which crop out mainly as the SW, NW and SE granites, respectively at related corners of the island, and are intruded by many later dolerite, lamprophyre and quartz-feldspar porphyry dykes (Lees, 1990, p. 273 et seq.) these too are generally considered Palaeozoic in age. The metamorphic rocks are low grade regional and thermal types of the above. Mesozoic and Cenozoic rocks occur around us on the sea bed but not on the island, so finally, our ancient rocks are overlain by our youngest deposits of raised beach gravels and pebbles, loess, glacial head, peat and aeolian sands ranging from Pleistocene to Recent in age (Bishop & Bisson, 1989, p.82 et seq.). The following stratigraphic table is a summary of the geological history, followed by more detail. 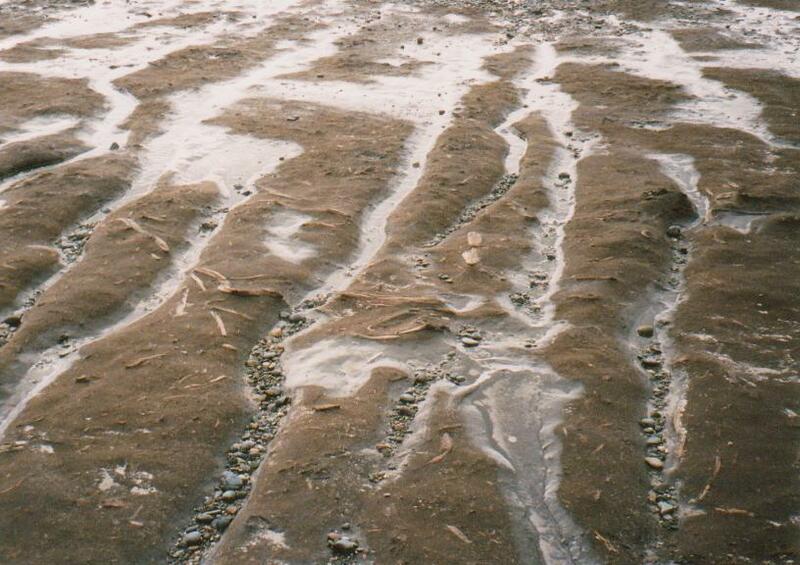 Peats c.7,090 - 3,500 "
Beach Clays 10,000 - c.7,090 "
8m R. beach 121,000 "
18m R. beach c. 200,000 "
^^^^^^uncon. NW Biot. m.gran. ? ? " " J. M. Dyke Swarm < 483 Ma "
" SE Roc/Gor. gran. 509 Ma "
^^^^^^discon. SW Aplite (cent.) 527 Ma "
Jersey Shale Fn. 680 Ma? U. Brioverian Grp (585-540 N'm'dy) Precam./Proteroz. 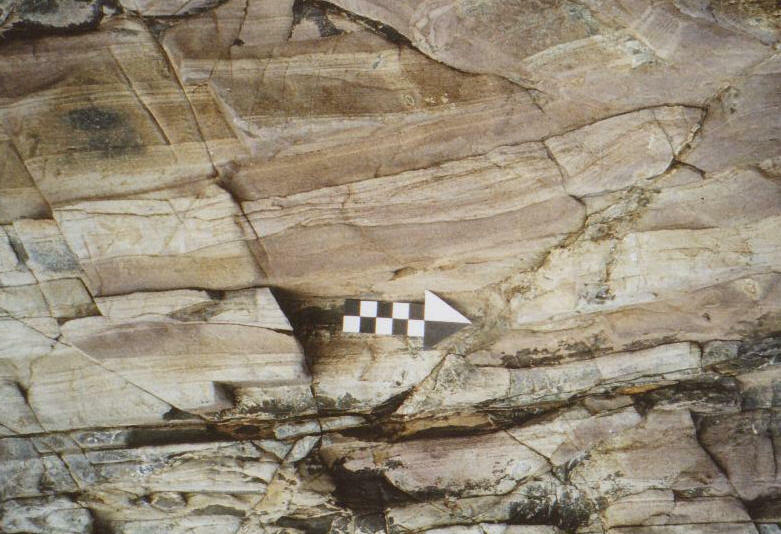 The Jersey Shale Formation is the oldest unit, thought to have formed 680 - 570 Ma ago (Bishop & Bisson (1989. p. 5) and consists of > 2500m of shales and interbedded thin sandstones and greywackes which, because of their stratigraphic relationships and sedimentary structures, are described as forming in various environments in a delta fan complex subject to turbidity currents flowing from the north. Being so far unfossiliferous, they have been given an Upper Brioverian age (in the late Proterozoic of the Precambrian) by comparison with similar rocks containing fossils in Normandy and Brittany (Brioverian is taken from Briovère, the Gaulish name for St. Lô in Normandy). Turbidites with cut & fill and grading, L'Étacq. These original sediments are thought to have been deposited by rivers flowing south from an ENE - WSW arc of land, the Le Vast Arc (from Le Vast, south east of Cherbourg) extending from the north Cotentin (Dupret et al, 1990, p.125) to north of our present position. 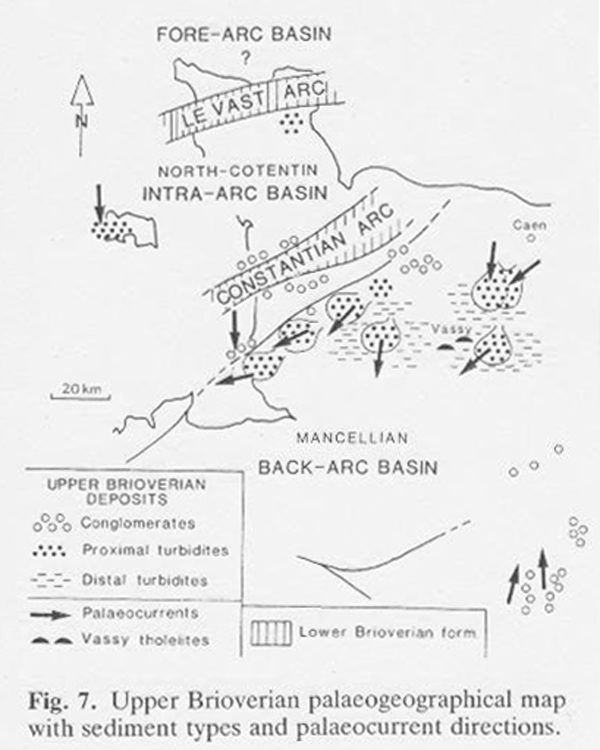 In a regional context, from stratigraphic studies in Normandy and Brittany, we were situated at this time in an intra-arc basin with a second, similarly striking arc, the Constantian Arc (after the 3rdC Roman name for Coutances), lying just to the southeast of us, half way to the present Granville area. To complete the regional setting, these arcs and basins developed on a basement or continent (Rabu et al. 1990, p. 86) now represented by gneisses (eg. 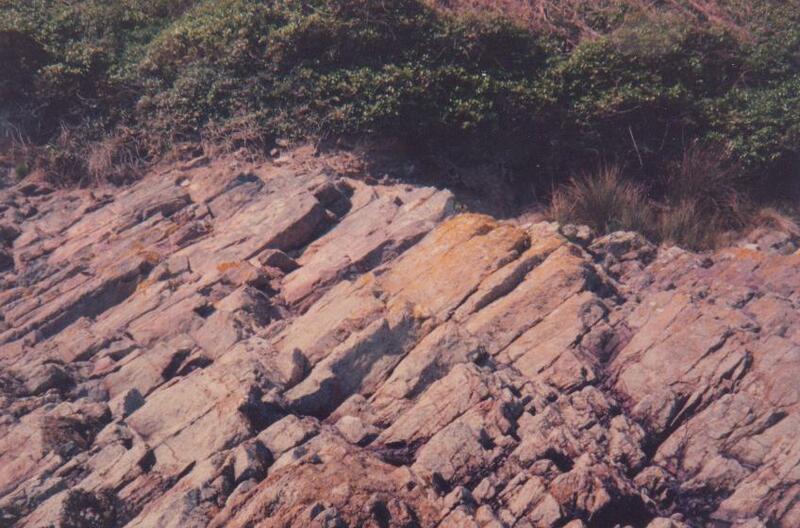 the Icart gneiss, c. 2000 Ma old in Guernsey ) on the northern edge of a land mass named Northern Armorica. This was situated in the present Brittany and Normandy region which was being thrust northwards over an oceanic area, sometimes named l' Océan de la Manche, the floor and crust of which was moving south east. The proposed subduction zone is thought to have been south of the present English Channel magnetic anomaly (Hurd Deep area). The proposed model for the geological setting of this region is the formation sequences of the Andes, an illustration of which is shown by Keary and Vine (1996, p.179). 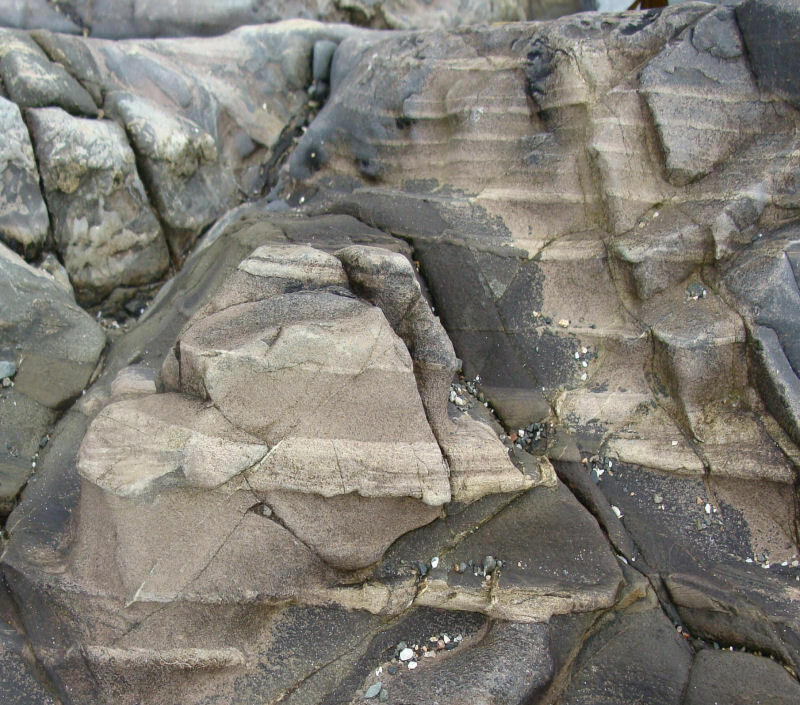 These deltaic fan deposits were indurated, folded and uplifted several times due to this collision between 600 - 522 Ma (possible Normandy equivalents being dated at 585 - 540 Ma), firstly by S - N compression (to produce the W - E folds) and then subsequently by W - E compression (to produce the S - N striking folds). This was a long episodic period of mountain building and has been called the Cadomian Orogeny (after Cadomus, the Roman name for Caen, capital of Normandy). They were also intruded, possibly in earlier Cadomian times by the granitic rocks which form Les Minquiers, Les Écréhous, Les Dirouilles and Les Pierres de Lecq (Pater Nosters) which are foliated and partly gneissic. The sequence of events relating to the formation and deformation of the strongly foliated granodiorite of Les Écréhous and the structural relationship of this reef, Les Dirouilles and Les Pierres de Lecq to Jersey; is clearly described and illustrated by Renouf & Andrews (1996, p.20). In summary, it seems that the Brioverian shales and greywackes, deposited in inter - arc basin, were folded and uplifted several times and then were eroded and became volcanic, possibly during early Cambrian times, c.522 Ma ago, as magma rose from the subduction zone. The folding episodes illustrated by the different fold strikes in the shales and volcanic formations and the intervening time intervals are unknown. The St. Saviour's Andesite Formation flows, pyroclastic deposits and minor basalts were the first volcanic rocks to form and c. 850m of them overlie a terrestrial conglomerate discontinuously in the north of the island (Helm, 1984; Bishop & Bisson, 1989, p.16) and seem to have changed the terrestrial landscape to compare with parts of the present Pacific 'Ring of Fire' where volcanoes have formed on the American land masses, rather than as off-shore island arcs. However, as they are disconformable overall on the Jersey shales, but conformable locally (Bishop & Bisson, p. 13) in certain parts of the island, the former situation seems more likely. No vents have been found but the authors think they may have existed to the north east and south. (loc. cit.). It is noticeable that no pillow lavas, spilites or other evidence of a marine environment has been found. The andesites were then eroded and another volcanic period developed. They have been dated (and debated) at 522 - 477Ma. Col. jointed rhyolites, La Crête (E. coast). The St. John's and Bouley Rhyolite Formations heralded a change to acid vulcanism and their volcanoes then began to erupt 1380m of banded, spherulitic and columnar-jointed flows, ignimbites and pyroclastic deposits across the weathered and eroded andesitic landscape during two different periods. Again, it is difficult to determine if we were part of an island arc situation or located at the leading edge of the Armorican continental landmass. They are assumed to have been deposited between c. 477 - 450 Ma ago. Conglomerates then formed after further uplift and erosion, and there is evidence that the climate was desert-like as 500 - 800m of them occur as alluvial fan deposits of unsorted pebbles and boulders with interbeds of red siltstones and sandstones implying that they were laid down by flash-floods in valleys and basins eroded in the rhyolite land surface in front of a fault scarp (Went & Andrews, 1990). These are dated between 450 - 427Ma ago. Rozel Conglomerate, St. Catherine's beach. The deposits contain clasts of shale, andesite and rhyolite and granite, but not of granite similar to any of the adjacent masses lying nearby at present. Are these clasts from upper parts of the present masses since eroded or from another, more distant mass? 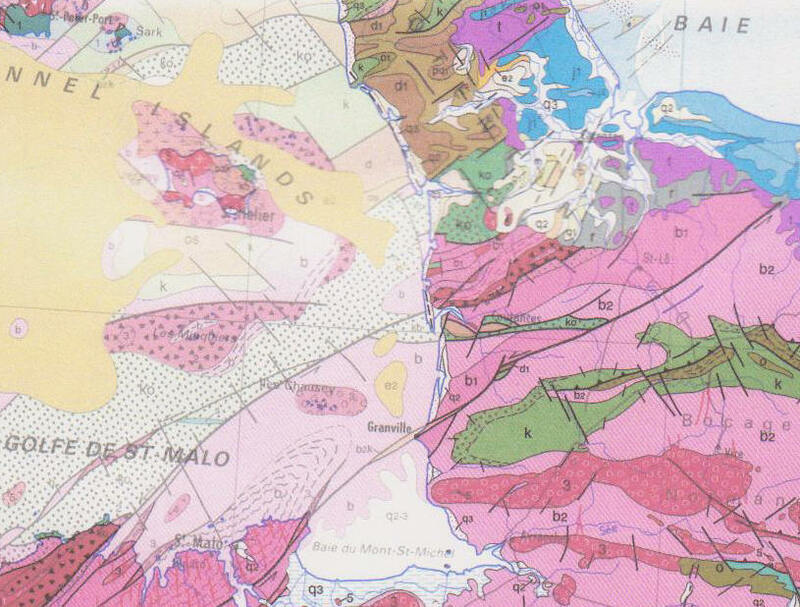 The major sinistral tear faults which affected the region during continued oblique subduction and divided it into terranes (see The Brittany Connection) could have moved our area far from source areas. Concurrently with their deposition, the above formations were intruded by the SE, SW and NW igneous complexes (summarised in the table above). From the uncertain dates obtained, the SE complex seems to have started first with gabbros, diorites and granites, followed by two more reliably dated granites of the SW complex. These were then followed by younger granites of the SE complex, and the youngest granite of the SW complex. 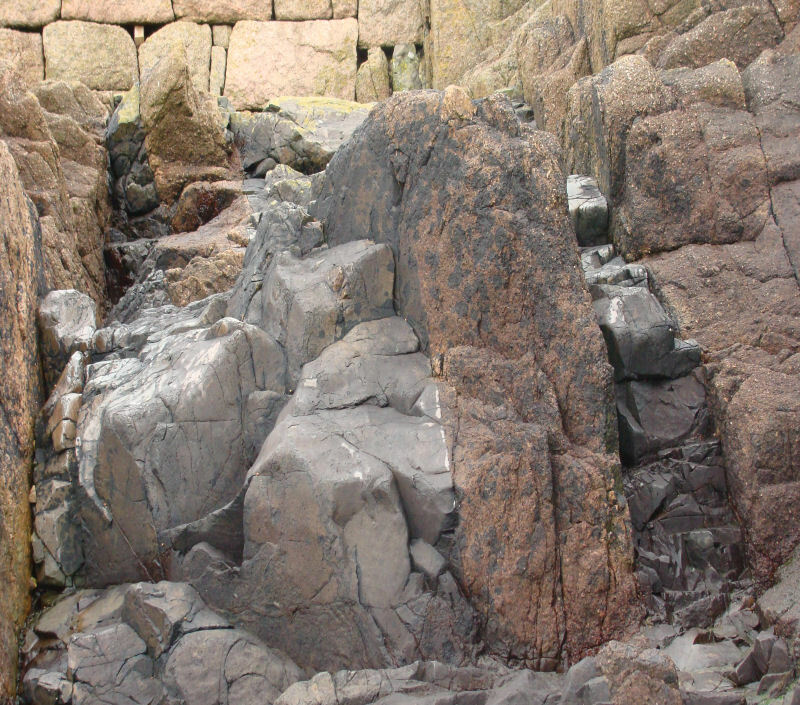 The Jersey Main Dyke Swarm was then intruded followed by the four granites of the NW complex one of which included gabbros and diorites like the SE complex (and one of which is not dated). The chronology of the intrusive episodes when viewed against that of the country rock formations may indicate cause and effect and/or orogenic periods. NW Granite-shale contact, Le Pulec, and NW granite, La Grève au Lanchon. Note that from geophysical surveys, the gravity results suggest that granites are continuous beneath the overlying shales and volcanic rocks (Bishop & Bisson, 1989, p.98-103, Figs. 23 & 25). It is thought that the gabbros and diorites were intruded first, followed relatively soon by the granites. Firstly, from c.550 - 483 Ma ago, three phases of intrusion produced the three different granites in the south west, containing very minor gabbro/diorite xenoliths which may indicate the presence of basic rocks at depth; secondly, from c. 465 - 426 Ma ago, four different granites, one associated with gabbros and diorites, were emplaced during four different phases in the north western part of the area; and thirdly or possibly coeval with the second, several granites, associated with gabbros and diorites, were intruded in the south east. None of these is foliated and they are therefore regarded as a result of post-tectonic activity as the area was relaxing or undergoing a period of relative tension. 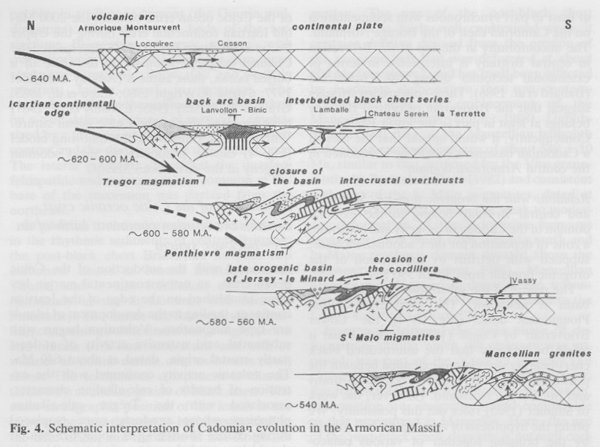 All this activity was occurring during Cambro-Ordovician times towards the end of "the Cambrian orogeny" (Brown et al, 1990, p. 196), or is this a later phase of the Cadomian? 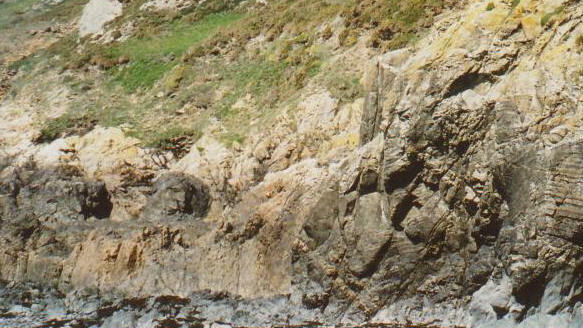 Other Cambro-Ordovician rocks on the sea bed are shown to be overlain by rocks of Silurian and Devonian age but none occurs in Jersey. Mountain building had finished, we had become a land area and it is suggested therefore, that we were an island during the rest of Palaeozoic times. However, were we then unaffected by the Caledonian orogeny which folded Lower Palaeozoic rocks 300 miles to the northwest and only affected by the Variscan orogeny which folded these adjacent Palaeozoic rocks and possibly folded our volcanic and conglomerate formations which accommodated to the underlying structural grain? We seem to have remained land throughout Mesozoic times when warm, Jurassic and Cretaceous seas in which limestones and chalk were deposited, transgressed nearby to the north of us in the present Channel and to the east of us around present Bayeux and Caen in Normandy. Pre - Mesozoic movement (?Variscan) including uplift seems to have occurred, as these overlying limestones and chalk are unconformable on the older rocks. In the Cenozoic, during Tertiary times, a marine transgression occurred again and we were nearly surrounded by widespread limestone deposits during the Eocene which lie close to the west and north of the island on the oldest Palaeozoic rocks, and further north on the Mesozoic rocks. Even about 15 Ma ago during the Miocena, warm seas which caused the deposition of very fossiliferous, clastic limestones of Les Faluns, penetrated inland into fault valleys within 50 miles east of us in Normandy and south of Dinan in Brittany. The Alpine Orogeny affected the region at this time, the major effects being seen in the gentle folding which created the Paris, London and Hampshire Basin areas. Finally, we come to the Quaternary, and the Pleistocene to Holocene times, when the various advances and retreats of glaciers during the Ice Age(s) caused eustatic (sea level) changes, land elevation changes and the formation of raised beach gravels and the deposition of glacial head and loess. During the several transgressions and sea level rises our island shape and topography were altered to give the present day wave-cut platforms and the mis-fit valleys. The plateau surface and its levels have formed over a long period of time (presently being surveyed by Dr. J. Renouf pers. com. 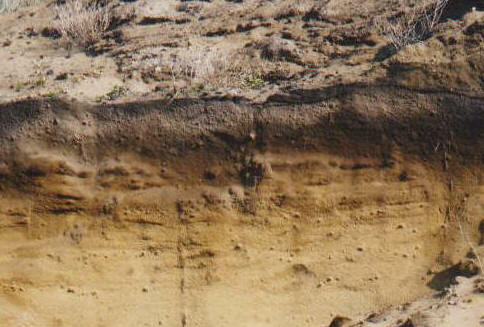 ), but its southerly gradient may have been formed by post-glacial uplift. The Recent littoral clays and peat deposits, are covered periodically by shifting present day beach sands and gravels, while in the narrow, coastal plain areas they are overlain by the sand dunes and present soil cover. These superficial deposits complete our history to date. Peat beds, Le Port, and overlying sands, gravels and humic layers, Les Mielles. D'Lemos. R. S., Strachan. R. A. and Topley. C. G. Eds. 1990. The Cadomian Orogeny. Geol. Soc. Spec. Publ. No. 51. The Geological Society. Dupret, L., Dissler, E., Dore, F., Gresselin, F., & Le Gall, J. 1990. Cadomian geodynamic evolution in the northeastern Armorican Massif (Normandy & Maine), pp. 115 - 131. In D'Lemos. R. S., Strachan. R. A. and Topley. C. G. Eds. 1990. The Cadomian Orogeny. Geol. Soc. Spec. Publ. No. 51. The Geological Society. Guerrot, C. & Peucat, J. J. 1990. U-Pb geochronology of the Upper Proterozoic Cadomian Orogeny in the northern Armorican Massif, France. pp. 13-26. In D'Lemos. R. S., Strachan. R. A. and Topley. C. G. Eds. 1990. The Cadomian Orogeny. Geol. Soc. Spec. Publ. No. 51. The Geological Society. Keary, P. & Vine, F. J. 1996. Global Tectonics. 2nd. Ed. Blackwell Science. Rabu, D., Chantraine, J., Chauvel, J. J., Denis, E., Bale, P., & Bardy, PH. 1990. The Brioverian (Upper Proterozoic) and the Cadomian orogeny in the Armorican Massif. pp. 81 - 94. In D'Lemos. R. S., Strachan. R. A. and Topley. C. G. Eds. 1990. The Cadomian Orogeny. Geol. Soc. Spec. Publ. No. 51. The Geological Society. Renouf, J. T., & Andrews, M. 1996. Geology; in Les Écréhous, Rodwell, W. (Ed. ), 1996. Société Jersiaise.